This control is Bootstrap 3 only. Use Navs in Bootstrap 4. Provide tab links for your site or app with customizable appearance. addItem(item, type) Adds an item to the end. type can be "active" or "disabled" . Runtime. 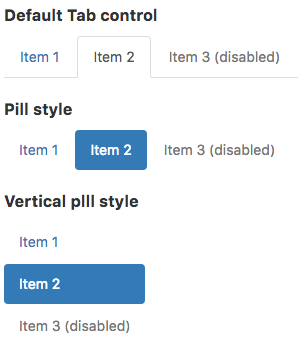 justified Make tabs or pills equal widths of their parent at screens wider than 768px. On smaller screens, the nav links are stacked. Design Time. pills Show tabs highlighted with Pill format? tabs or pills. Runtime. text Get the text of the active tab. Runtime. value Get and set the active tab. Runtime. vertical Show Tabs/Pills vertically? (If so, >selected only works for Pills.). Design Time. This page was last edited on 10 March 2019, at 15:32.